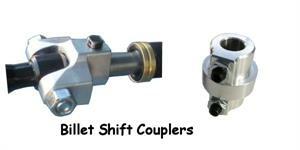 Billet Shift Couplers - Best on the market !!!! Home > Transmissions, Mounts & Components > Billet Shift Couplers - Best on the market !!!! Billet Shift Couplers - Early and Late. Want the best Shift Couplers money can buy? Here you go..... Early fits all Bugs to 1964 and Late fits all Bugs 1965 on. Click more info to choose yours.